Chicago did not entirely shut down Wednesday, but it came close. As the temperature reached minus 23 degrees, many businesses told employees to stay home. Some will also get Thursday off. 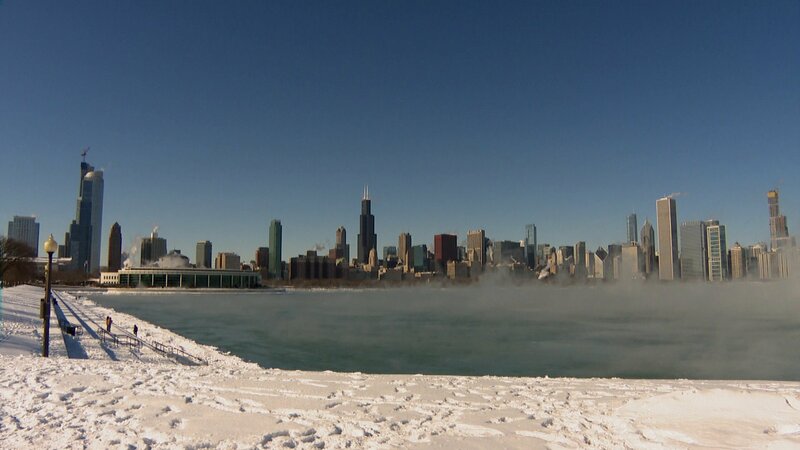 While Chicago is seldom brought to its knees by brutal weather conditions, Wednesday was a rare exception, and though the temperatures made it dangerous outside, the deep freeze also created a beautiful day. Some grown-ups that had the day off from work braved the conditions to see the frigid beauty of the lakefront. Chicago resident Cindy Oritz and her husband went to see the billowing clouds of steam rising from Lake Michigan at Montrose Harbor. “It’s beautiful!” said Ortiz. “This is something that we probably are not going to be able to see ever again.” With that, Ortiz ran back to her car where her husband had taken shelter moments earlier. Johanna Wawro called the polar temperature at Montrose Harbor “invigorating” but admitted it was taking a quick toll on her. “When you breathe,” she said, “you can feel the Arctic air in your lungs.” She nevertheless spent time taking in the spectacular view. For Wednesday, at least, the city that works came to a standstill as Arctic air transformed the urban landscape into a polar vista. The city’s famed museums were all closed. The hottest ticket in town, the hit musical “Hamilton,” succumbed to the second coldest day in the city’s history by canceling its two performances. Some of Chicago’s homegrown food and drink establishments either shortened their hours or closed their taps altogether. A handwritten sign on the door of Lou Malnati’s in the West Loop indicated an earlier closing time than usual. And a little farther west, the Goose Island brewery on Fulton street was shuttered altogether. Perhaps the most ironic cancellation in Chicago was at the United Center, where Wednesday night’s performance of “Disney on Ice” was called off. But not everyone did or could take the day off. City crews tended to a broken water main at the intersection of Howard and California on the city’s Far North Side, where several cars were either coated in ice or stuck in frozen sludge. Some Loop dwellers soldiered on as the polar vortex transformed what would normally be a bustling downtown into a ghost town. Joseph Scaccia was helping a friend in the Loop move on Wednesday when his car battery died. As he walked along Dearborn Street, he carried some newly bought booster cables. But Scaccia seemed to be taking everything, including the weather, in stride. “I’m wearing like a dozen [pairs of] long underwear,” Scaccia said jokingly. But perhaps that’s the tall tale he’ll someday tell his grandchildren about one of the coldest days in Chicago history.